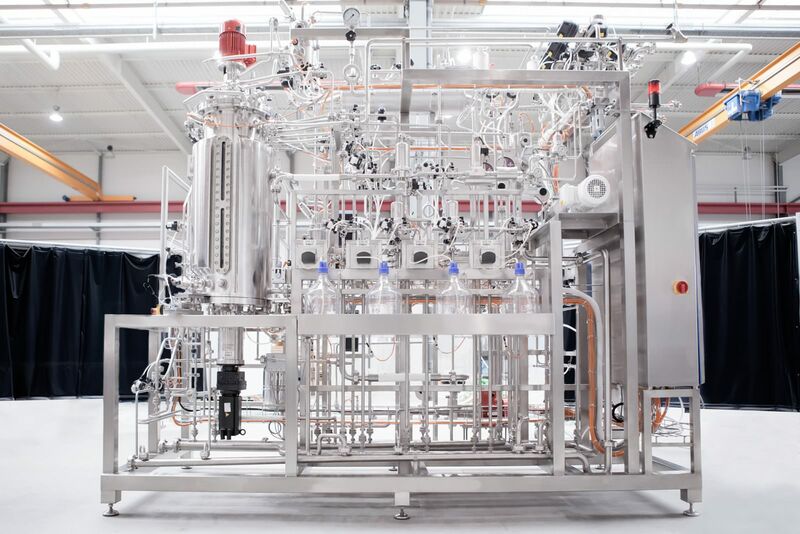 The food-, pharma- and cosmetics industry uses bio-reactors, also called fermenters, to ferment organic substances by adding bacteria, fungi or enzymes. Our customers efficiently and safely cultivate cells and microorganisms as well as yeast and bacteria at the Ruland-bio-fermenters and bio-reactors. The fermentation processes are highly sensitive and the hygienic demands are high. For an exact reproduction of the biological process flow, Ruland uses GMP-compliant aseptic technologies with fully automated measurement- and control technology. This allows our customers to control the processes at the fermenters in every detail. The Ruland-fermenters are used for example to produce bacterial cultures for the production of yoghurt and other bacteria cultures for the production of insulin. Regardless of the purpose, each fermenter is similarly structured and constructed in hygienic design. They consist of a stainless steel container, a gassing module as well as of a mixing device including the suitable agitator, sterile filter and heat exchanger. Appropriate sensors and measurement transducers continuously control inter alia the filling level, oxygen, nutrient supply, temperature, pH-value and if applicable foam formation. The values are reported to a central control unit (SPS) and are recorded. We consequently adjust the process technology for the fermenters to your products and requirements. 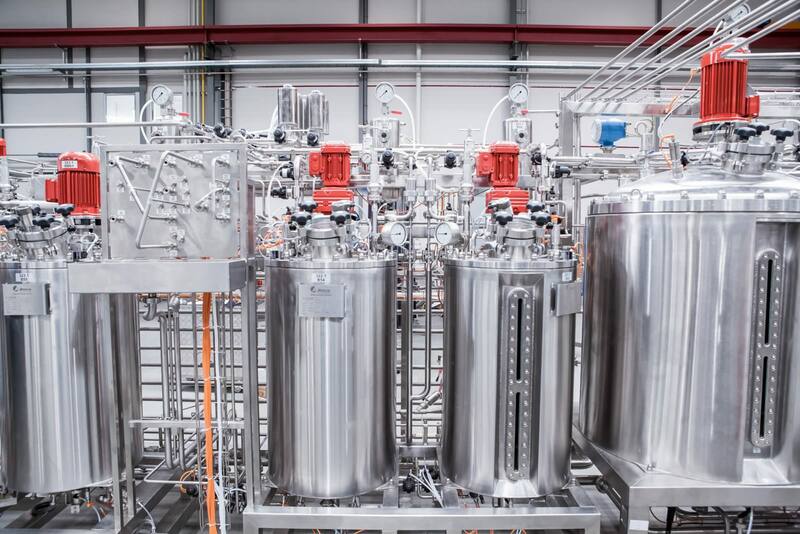 We use our comprehensive expertise in the area of aseptic plant construction for anaerobic and aerobic processes, for the sterile addition of media or for in-situ media sterilisation. This could be for batch processes where the bio-reactor is completely filled and emptied again after expiry of the reaction time. Alternatively, as fed-batch process where the culture medium is added bit by bit and the fermenter is emptied as soon as the maximum capacity is reached. We also use continuous processes for the fermentation. Each bio-reactor and fermenter that is constructed by Ruland is CIP- or SIP-able. Ruland delivers fermenters and bio-reactors as pilot plants developed in laboratory scale or as industrial large-scale fermenters for the production. Like with other projects, we also help you to scale up your fermenters and bio-reactors, if the production, process and product was first tested in a smaller scale. The fermentation of products has many common areas of application. Most of them are known from the food production. Fermented products are for example Wine | Tobacco | Tea | Cocoa | Sauerkraut | Miso | Cheese | Yoghurt | Buttermilk | Vinegar. Fermenters are also used to produce beer. Beer is fermented at cylilndric-conical fermentation tanks. Great quantities of many medical products are produced industrially in bio-reactors. For example antibiotics like Penicillin | Insulin | Hyaluronic acid and bacteria. Fermenters for biogas are used to produce biogas by fermenting biomass. Do you need further information on fermenters or bio-reactors?